A Smart Key is an electronic device used to remotely lock, unlock and start the vehicle along with some other functions not traditionally assigned to a key. Essentially a smart key is a device that allows the saving of information on it. The key then allows the vehicle to recall this information when necessary once they make a connection. A smart key connects to the vehicle by using a digital code. The key fob contains an identification code and the vehicle uses a proximity sensor to recognise the presence of the key via the code because it's stored in the vehicle. Being a common feature on high end vehicles from various marques, there are several well known benefits of the smart key which will now be listed but every kill will not have all these features. The keyless entry feature which allows you to lock and unlock your vehicle without physically using the key. You lock the vehicle by walking away with the key and it will unlock once the key is in close proximity. The key can be set to unlock one door or multiple doors or even the trunk on entry. The keyless start feature which allows you to start and switch off the engine without turning the key. There is a start/stop button to switch on the engine once the key is in the vehicle. Some vehicles may require you to to just apply the brakes and press the button while other may require you to insert the key into a slot along with the brakes and button. The memory function for the power seats along with mirrors and steering can be saved into the key and be recalled whenever the key is used. Your favourite radio stations and other infotainment settings can also be saved unto the key and be recalled. The key may be used to turn on the headlamps as you approach the vehicle or remotely trigger the alarm if you should ever have the need to do so. 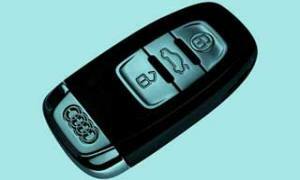 Some smart keys can allow the vehicle to have a reduced top speed or reduced horsepower. This may be done on extremely powerful vehicles like the Bugatti Veyron by sending instructions to the engine management system. Volvo's smart key called the personal car communicator (PCC) allows to use the key fob to check the status of your vehicle within a certain range. The status meaning if the alarm has been triggered or if any part of the vehicle has been interfered with. If you're out of that range the key will give you the status of the vehicle when it was last within the range. This range may allow you to check the status when the vehicle is out of sight. Some vehicles may have a back up traditional key or the smart key may be able to be used as a traditional key in the rare event that the smart key should be giving any problems. The shape or design of a smart key may vary from vehicle to vehicle, A common design is a solid key fob with buttons for a few functions. Some key fobs are similar to a debit/credit card (flat/two dimensional) that can be easily placed in a wallet. It is customary for marques to give a name to a feature. The smart key is known by these names and more throughout the industry; Keyless Access System, Advanced Key, Comfort Access, Adaptive Remote Start, Proximity Key, Smart Key System, Intelligent Key and Intelligent Access.